"JSC “Latvia’s State Forests” in cooperation with National Centre for Education of Republic of Latvia and Riga Technical university will organize the 14th European Forest Pedagogics Congress 2019 in Latvia – Riga and Tervete from 1th – 4th of July, 2019. The congress theme is “DESIGNING BRIDGES BETWEEN FOREST AND SCHOOLS“. How to link the forest pedagogy programmes and regular schools? How can forest educators and teachers cooperate on pupils' learning? The congress is a forum for exchange of knowledge and experiences in the field of forest pedagogy. The continuity of the congress is guaranteed by Forest Communicators Network – Subgroup Forest Pedagogics, part of both the UNECE Timber Committee on Forests and the Forest Industry and the FAO European Forestry Commission. This year congress will start and end in Riga – capital city of Latvia - to reach wider audience from the schools and media, but the first evening of the congress will be celebrated on coast of the Baltic sea in Latvia’s state forests. Following the theme teachers from Latvia will join the programme activities on July 2nd in Riga Technical University where workshops focusing on designing new practices will take place. 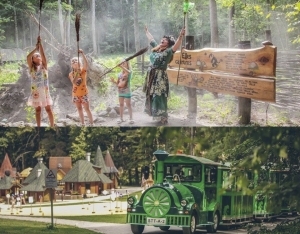 On July 3rd there will be a day trip to LVM nature park, the most visited forest of Latvia – where congress participants will be involved in Market of Activities and other pursuits. UEF, as an active member of the group will be there, represented by its Secretary, Thomas Baschny and its treasurer, Anna Petrakieva. You'll have some feedback after this congress, here on our web site.